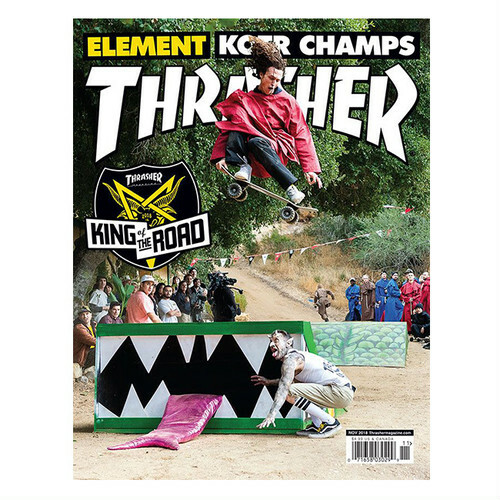 Win the trophy, get the cover—Evan Smith led Element to a ’17 KOTR victory, snagging the MVP title and the front of the Bible along the way. Full behind-the-scenes King of the Road recap in the Nov 2018 issue, including interviews with the teams (Element, Foundation and Real), Jamie Thomas weighing in on strategy, too-hot-for-TV moments, the medieval midway-meet-up madness as well as musings from the men who were married on the mission. And if you need a little Peace in your life, this one's also got interviews with Mason Silva and Evan Smith, both heavy hitters in Element’s new vid, as well as KOTR survivors. If you’re a fan of unbridled insanity and balls-to-the-walls challenges, this is the issue for you. Check!